Editor’s NoteFake foreign experts from “all industries” are frequent guests on the Russian TV shows. Such Kremlin-aligned speakers often become the “original sources” of disinformation, the foreigners repeat the Russian propaganda narratives to convince the domestic audience of the plausibility of disinformation and to promote the desirable opinions among the foreign audience. 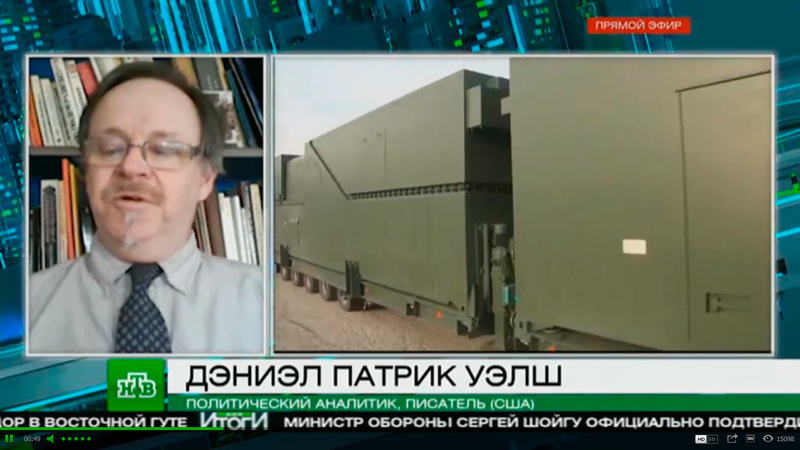 However, such experts on Russian TV are often just random foreign persons who are far from the claimed areas of expertise. Here is the latest example of an American “political analyst” who lives off selling soaps and CDs with himself singing his own songs. Research conducted by journalists from the Russian independent outlet The Insider shows that this commentator’s main claim to fame is that he sells soaps and CDs with himself singing his own compositions on his private website. He calls himself a writer, but The Insider was not able to find any book authored by him, identifying only a few articles published on lesser-known websites. NTV is owned by the well-known state-owned Russian gas exporter Gazprom and is known for loyally, sometimes even aggressively pushing the Kremlin’s political line. As we have previously described, pro-Kremlin international media such as Sputnik and RT, but also Kremlin-controlled media inside Russia, have a long track record of identifying commentators from Western countries who are not particularly well known in their own country, and presenting them as international authorities in a given field, provided that what they say confirms the pro-Kremlin narrative.